Its a Wonderful Movie - Your Guide to Family and Christmas Movies on TV: PRIME TIME - for a little CHRISTMAS SHOPPING in JULY! PRIME TIME - for a little CHRISTMAS SHOPPING in JULY! Do you remember when your local stores had HUGE sales in July? I sure do. When I was a little girl, our hometown shops would have sidewalk sales every year. All the local stores would participate and line the sidewalks with racks and racks of clothes, shoes, or whatever goods they had for sale - trying to lure you in with a great discount on overstock items they were eager to sell and make room for more inventory! Oh, how I loved looking through all the pretty things and finding something special. Often, it might be the very last one, so you had to find it first and fast! Those were the days! Does anyone do that anymore? Starting today, as you probably know, AMAZON is having their own BIG JULY SALE... it's Prime Day TODAY - with specials on all kinds of products! So, I thought I would get in on the fun and share these Christmas items - to help you decorate and get in the Christmas in July spirit! 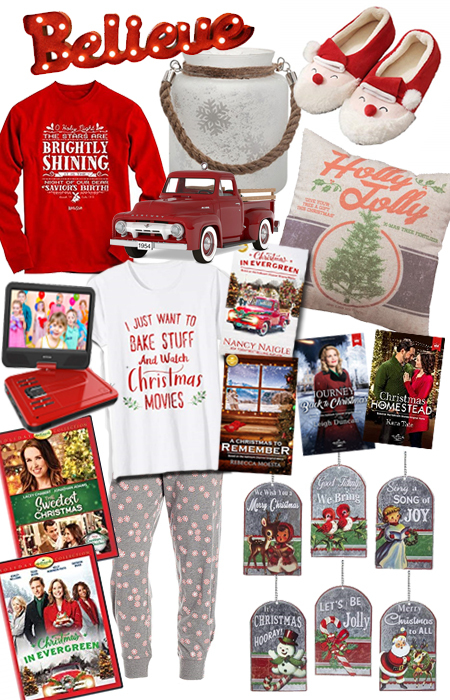 The Christmas t-shirt and lounge pants featured on the bottom left are my own personal favorite... ideal and comfy for a little Hallmark Christmas movie watching, baking, or snuggling up with a good Hallmark Christmas book! Besides these items, there are many, many hourly amazing Amazon deals that you may have to be almost first in line to get! What do you have to do to get them? Then, visit Amazon's site, starting Today - Monday July 16 at 3pm EST. for incredible deals! Actually, I hear it started early - so visit now! The big sale lasts 36 Hours this year! Be sure to check Amazon - for many other special offers! I hear there will be incredible low prices on all sorts of Amazon products, such as Alexa and Amazon Basics! Happy Christmas in July shopping, Everyone! Thank You Net for the Great Ideas. Oh...yes I remember the sidewalk sales with my family every summer...those were the days! I will be shopping today for sure! Happy Christmas in July Shopping Y'all!!!!! Hope you were able to get some good deals, Mary. I had a bit of a hard time getting Amazon's site to work for awhile, but later got in! I think it was overloaded with visitors. Happy Christmas in July to you, too! to the Altar was prime-- I enjoyed every moment. I felt every emotion, laughing and crying and smiling. The movie gave me hope and joy and love. Awe, that was such a sweet thing to say! It was, indeed, prime viewing! Another SSD treasure among all the rest of the series! I'm so glad it gave you all the feels! I personally loved the prayers sewn into each bridal gown, that was such a beautiful touch to the story. Thank you for sharing your love of SSD!